The Cutler Bay town council heard from 9 candidates on Tuesday evenings special meeting before appointing Sue Ellen Loyzelle to the Council Seat 2 position. Ms. Loyzelle, who is employed as the director of grants for the YMCA of greater Miami, will serve as the council appointee until the next county-wide election. The Cutler Bay town council spent several hours at the December 6th special meeting discussing who would fill the Vice Mayors position. After numerous nominations and rounds of voting, the council agreed to appoint Ernie Sochin as the town's Vice Mayor. Track Santa as he makes his rounds at noradsanta.org. Saturday, December 18th from 10am to noon. Children of all ages are invited to listen as Santa Claus reads some classic holiday stories next to the Christmas Tree at the Deering Estate's Stone House Ballroom. After story time, children are invited to participate in an arts and crafts activity. Admission to the estate is $12 for adults and $7 for children (ages 4-14). For more information visit deeringestate.org. Saturday, December 18th. Visit the Macy's Wing of the mall at 2pm for their monthly Kids Club event. This month's activities include a holiday magic show, music, face painting, balloons, prize giveaways and more. The activities are free. Children 12 and under are welcome to participate. Then at 3pm, visit Center Court for musical performances including hand bell choirs and Christmas Caroling. On Sunday, December 19th, from 2-4pm (arrive by 1:30). Take a cruise on the "Pelican Island Skipper", a 45-foot catamaran, as you explore the waters of Biscayne Bay. The cruise is open to all ages at a cost of $35 per person. Reservations are required. Call 305-235-1668 ext. 233. For more information, visit deeringestate.org. Saturday, December 23rd from 7-9pm. Kids, bring your parents to meet Santa. Enjoy a holiday meal with your family at Wings of Asia, watching the aquatic birds. Children will receive a holiday plush gift and enjoy making their own holiday ornaments. Price for non-members is $42.95 for adults, $39.95 for children age 3-12. Admission includes free parking, admission to “Zoo Lights” with unlimited carousel rides, and a classic turkey and ham dinner. Space is limited so reserve your seat today. For more information, visit miamimetrozo.com. During weekday afternoons, a large group of young black and white males are going to houses in the Cutler Bay area pretending to sell cleaning products. When they find that the homes are unoccupied they later return to burglarize the homes. If you see this group going door to door, please contact the police department by calling 305-4POLICE (305-476-5423) or if the burglary is in progress call 911. Registration is now open for kids ages 4 and up interested in water polo, splash ball and swimming. Water polo practice: M-F 6pm – 8pm and Sat. 1pm-4pm at Gulliver Preparatory, 6575 N. Kendall Dr. Splash ball practice: M-W 6pm-7pm, Fri. 4:30pm-6pm, Sat. 1pm-4pm at Cutler Ridge Pool, 10100 S.W. 200 St. Swimming practice: M-Th. 4:30pm-6pm at Cutler Ridge Pool. For more information, contact Coach Carroll Vaughan at MiamiRiptides@gmail.com. The town is currently accepting applications from residents interested in serving on the council as the district seat two representative. A special council meeting will be held on Tuesday, December 14th, 7pm at the South Dade Regional Library to discuss the appointment. Qualified residents interested in the position should contact the Cutler Bay Town Clerk, Esther Coulson, at 305-234-4262. A resume must be hand delivered to Ms. Coulson at town hall by 4pm, Friday, December 10th. THIS APPOINTMENT IS OPEN TO DISTRICT 2 RESIDENTS ONLY. The appointee will serve until the next countywide election. If the council is unable to come to an agreement, then the town will hold a special election within 90 days. Saturday, December 11th, starting at 7pm. This annual parade takes place along the Bel-Aire Canal in Cutler Bay. Residents can get a good view of the parade from the Marlin Rd bridge (at Bel Aire Drive), or the foot bridge located at Bel Aire Drive and Cutler Ridge Drive (near Cutler Ridge Park). See the map for locations. Saturday, December 11th and December 18th from 10am to noon. Children of all ages are invited to listen as Santa Claus reads some classic holiday stories next to the Christmas Tree at the Deering Estate's Stone House Ballroom. After story time, children are invited to participate in an arts and crafts activity. Admission to the estate is $12 for adults and $7 for children (ages 4-14). For more information visit deeringestate.org. Tuesday, December 7th from 7 to 8:30 pm. The Village of Palmetto Bay will be holding a community outreach meeting regarding a proposed mixed-use development to be located on the east side of Franjo Road and north of SW 180th Street in the Franjo Triangle Island. Sunday, December 5th, from 10am-6pm. Visit Pinecrest Gardens for an all-day event of music, puppeteers, mimes, story tellers, and performances from the works of Charles Dickens. General Admission is $5.00, free for children 5 and under. For a schedule of events visit pinecrest-fl.gov. Pinecrest Gardens is located at 111000 Red Road. Phone 305-669-6990 or visit pinecrestgardens.org for more information. The town council was unable to reach an agreement on the appointment of a Vice Mayor at the December 1st special council meeting. Special council meetings have been scheduled at Cutler Bay Town Hall on December 6th, 7th and 8th at 7pm for additional discussions. In the meantime, they agreed to reopen the application process. Qualified residents interested in the position should contact the Cutler Bay Town Clerk, Esther Coulson, at 305-234-4262. A resume must be hand delivered to Ms. Coulson at town hall by noon, Monday December 6th. The appointee will serve until the next countywide election. If the council is unable to come to an agreement, then the town will hold a special election in February. Friday, December 3rd at 7pm. Kick off the holiday season with the Deering Estate's Annual Tree Lighting ceremony in the historic Stone House Ballroom. Enjoy live performances by the Yuletide Carolers. Admission is $12 for adults and $7 for children (ages 4-14). For more information, visit deeringestate.org. On Saturday, December 4th, from 8am-3pm, Holy Rosary Catholic Church will be holding a flea market. This venue provides a great opportunity for residents sell their unneeded items. For booth information, call Elaine at 305-345-1683. Holy Rosary Church is located at 18455 Franjo Rd. Saturday December 4th at 7:30 pm. This Annual musical event features an array of musical performances for an evening of filled with the sights and sounds of the Christmas season. This event takes place at the Old Cutler Presbyterian Church, located at 14401 Old Cutler Rd. Call 305-238-8121 or visit ocpc.org for more information. Every Sunday from 9am-2pm. Taste the very best of local and organic farm-raised seasonal produce. Also, fresh flowers, fruits, herbs, organic foods, and a sampling of eco-friendly products. The market takes place next to the parking lot at Pinecrest Gardens, located at 11000 Red Road. This recreational soccer program for both boys and girls will be starting their winter season soon. Practices and games take place at Coral Reef Park in Palmetto Bay. Registration deadline is Saturday, Dec. 4th. Visit miamisportsclub.net for more information. Fairchild Garden is offering free admissions on Wednesday December 1st, from 9:30am to 4:30pm. Enjoy their tropical rainforest, butterfly garden, take a yoga class (9:30 am) and tram rides. All for free. For more information, visit fairchildgarden.org. The election of Ed MacDougall as Mayor of Cutler Bay has left a vacancy in the position of Vice Mayor that must be filled by council appointment. Qualified residents interested in the position should contact the Cutler Bay Town Clerk, Esther Coulson, at 305-234-4262. A resume must be hand delivered to Ms. Coulson at town hall by 12 noon, November 24th. The council will then consider the applicants at the council meeting on December 1st. The appointee will serve until the next countywide election. Cutler Bay Town Hall is located at 10720 Caribbean Blvd. Now that the elections are over, you can re-purpose your campaign signs by cutting them to fit the bottom of your reusable shopping bags. In addition, the cardboard signs are recyclable and can be placed in your blue recycling bin. Friday, November 19th, 6:30 pm (movie begins at 7pm). Join your friends and neighbors for a showing of the movie “How to train your Dragon” (Rated PG-13). The movie takes place at the Cutler Ridge Elementary School field at Cutler Ridge Park. Bring your lawn chairs, and blankets. Admission is FREE. Hot dogs, popcorn,candy and drinks will be available for purchase with the proceeds benefiting the Cutler ridge Elementary School PTA. Saturday, November 20th from 10am-5pm and Sunday November 21st from 10am-4pm. Featuring handmade arts and crafts, live music,, children's activities, Santa, classic cars and plenty of food. The event takes place at the Miami-Dade Fair expo located at 10901 Coral Way. Visit miamiharvest.webs.com for more information. Saturday November 20th from 9am-3pm. Visit St Thomas Lutheran Church for their holiday fair featuring crafts, food and an auction. St Thomas Church is located at 17700 Old Cutler Road, in Palmetto Bay. Phone 305-232-1227 for additional information. This huge week long event features an array of author discussing their latest books, book signings, and other events culminating in a 2 day street fair. For more information, go to miamibookfair.com. The following events take place at the South Dade Regional Library, located at 10750 SW 211th St. Phone 305-233-8140 for more information. Teen Video Gaming Competition – Thursday, Nov. 18th, 5:00pm. Celebrate National Gaming Day by participating in the Teen Video Gaming Competition. Winners move on to the final rounds at the Main Library, Saturday, December 4th at 3pm. You must call the library to register prior to the event. Music Therapy – Saturday, November 20th, 11:00 am. This special program for children under 5, teaches caregivers how to use music to help children learn and develop. Yoga and Meditation – Saturday, November 20th, 3:30pm. Use simple exercises, along with relaxation, meditation and breathing techniques to renew your body and mind. Benefits are reduced stress and increase mental clarity. Recommended for Teens, Adults, and Seniors. On November 12th-14th from 9:30am–4:30pm. This 70th annual event includes, more then 15,000 plants for sale, live music, antiques and collectibles, old and rare books, art. Enjoy live music, a farmers green market, lots of food vendors and Kid Way, with face painting, shows, games and more. New this year, Design Fairchild, a design and furniture show celebrating eco-innovation. The event takes place at Fairchild Tropical Garden, located at 10901 Old Cutler Rd. Call 305-667-1651 ext. 3344 for additional information, or visit fairchildgarden.org. Admission is $25.00 for adult non-members, $18.00 for seniors 65+, and $12.00 for children 6-17. November 13th, beginning at 8am. For great family fun, join your neighbors for a 10.6 mile bike ride through the Town of Cutler Bay. Registration is from 8:00-8:30am., with a "safety rodeo" at 8:30. The ride begins for participants 10 years old and up at 9am. Younger kids will participate is a shorter, supervised ride, followed by kid friendly activities. The ride begins and ends at the clubhouse at Isles of Bayshore, 21864 SW 93rd Path. Helmets are required. For more information, phone town hall at 305-234-4262. November 13th and 14th from 10am-5pm. Visit the Redland Fruit and Spice Park for this Eco-friendly festival. The event includes a local and organic farmers market, alternative energy exhibits, herbs, oils and teas, natural foods and culinary plants. Enjoy live music, and children's activities. Take advantage of services including aromatherapy, yoga, Tai Chi, Reiki, and chair massages. For more information, call 305-247-5727. The Redland Fruit and Spice Park is located at 24801 SW 187th Ave., in Homestead. November 14th, noon to 6pm. Bet Shira Congregation will be holding a holiday bazaar featuring items such as jewelry, handbags, housewares, ceramics, toys and gifts for the holiday. Bet Shira is located at 7500 SW 120 St., in Pinecrest. For more information, phone 305-238-2601. Thursday, November 11th. In honor of Veterans Day, Zoo Miami is offering a 50% discount on admission for up to six people for veterans and active duty military personnel. A valid ID must be presented to receive this discount. Fairchild Garden is offering free admissions on Wednesday November 3rd from 9:30am to 4:30pm. Enjoy their tropical rainforest, butterfly garden, take a yoga class (9:30 am) and tram rides. All for free. For more information, visit fairchildgearden.org. Friday, November 5th, starting at 7pm. Visit Norman Brothers Produce for their annual wine tasting. Taste dozens of wines from around the world, and enjoy amazing food. Cost is $30 per person in advance, and $40 at the door. The proceeds go to UM/NSU Card (Center for Autism and Related Disabilities). Norman Brothers is located at 7621 SW 87th Ave (Galloway Rd). For more information and tickets, call 305-969-3900 or visit autismsocietymiami.org. November 6th from 9am to 5pm. Featuring hundreds of Christmas and craft items created by church members. The fair includes a bake sale, fresh cinnamon rolls and coffee, enjoy a chicken barbecue from 11am to 4pm for only $6.00 or have a hot dog lunch. There will be free rides for the kids and free health screenings. The event takes place at Cutler Ridge Methodist Church, located at 20740 Old Cutler Rd. Admission is free. Call 305-233-7457 for more information. November 6th , from 9am-5pm and November 7th from 8:30am-4pm (no admittance after 3pm). Come to the air show and see two days of spectacular flying feats, including the Blue Angels. The event takes place at the Homestead Air Reserve Base, located at 29050 Coral Sea Blvd, Homestead,. For more information visit, wingsoverhomestead.com. Elections will be held on November 2nd for the positions of Mayor, Councilmember- District 1, and Councilmember- District 3. Get the latest information about the candidates, campaign finance reports, voting records of current council members, a breakdown of sponsored legislation and other information, visit our elections page at cutlerbay.net/elections-2010. Candidates seeking election in Cutler Bay participated in a debate hosted by the Whispering Pines Civic Association. In this forum, candidates were given the opportunity to ask each other questions. It's definitely a must see before you vote. You can watch the video by visiting cutlerbay.net or cutlerbay.com. Just updated. See the candidates' financial reports. How much have the candidates collected and from whom. Are the majority of the funds coming from local residents or from outside Cutler Bay? To find out more, visit our election page. For our readers in Palmetto Bay. To find out information about candidates running for office in Palmetto Bay visit palmettobay.us. Here you will find information on candidate websites, new articles about the candidates, campaign finance reports along with video of a recent mayoral debate. Be an informed voter and visit palmettobay.us before you vote. Wednesday, October 27th from 6:30 to 8:00 pm (Registration starts at 6pm). Commissioner Katy Sorenson in conjunction with the Office of Sustainability is holding a home energy workshop. Learn how to save $750 a year, get a free compact Fluorescent light bulb, and for the first 50 residents, receive a free home energy savings toolkit worth $100. The workshop takes place at the South Dade Regional Library located at 10750 SW 211 Street. Saturday, October 30th, 7am check-in, run/walk begins at 8am. Help in the fight against cancer by sponsoring or participating in this event taking place at the Deering Estate. There will be food and beverages at the end, along with live music. Kids can visit the Family Area, where they’ll find bounce houses and other attractions. Registration is on-line or on on the day of the event. For more information, visit reasontorun.org. Saturday, October 30th-31st, from 10am-5pm. Don't miss the Cultural Council's 20th annual "In The Park With Art", at Palmetto Bay Village Center, overlooking Biscayne Bay. Enjoy the art work of over 100 international and national artists that participate in this juried, award-winning fine art show. Admission and parking is free. For more information visit culture-council.org or call 305-238-0703. October 16th-31st from noon to 5pm. Visit Zoo Miami's (formally Metrozoo) 7,000 square-foot haunted house where every fear comes to life. Admission cost is $5.00 per sonson. For more information, visit zoomiami.orgmiamimetrozoo.com/events.asp. October 22, 23,29, and 30th, from 6:00-9:00pm. Join the fun as the Gold Coast Railroad presents a family fun event. Enjoy hay rides, classic monster movies, grave yard dig, costume contests, trick or treat stations, food concession stand, a bounce house and a haunted house train. Cost is $5.00 for all ages. Call 305-253-0063 for more information. October 29th and 30th from 7-11pm. This after-hours family event includes entry in Dr. Wilde's Creepy House, spooky tram rides, ghoulish carousel rides and chilling story telling around a fire pit. $10.95 pp admission. There is a discount if tickets are purchased online before the event. For more information, visit miamimetrozoo.com/events.asp. Saturday, October 30th, from 6-9pm at Cutler Ridge Park. Experience the terror of the haunted house, the adventure of the spider egg hunt, the costume contest, great food, and don't miss "Track or Treat" taking place around the walking path. Cutler Ridge Park is located 10100 SW 200th St. Call 305-284-4166 for more information. Saturday, October 30th from 2-4pm. Trick or Treat at the mall. Kids 12 and under, visit the fountain area by TJ Maxx to get your Halloween goodie bag. Then from 5-7pm enjoy creepy crafts, ghoulish games, spooky tattoos along with a costume contest, prizes and more. All activities are FREE. On October 31st Cutler Ridge Parks Haunted House only will be open for an additional night of terror. Cutler Ridge Park is located 10100 SW 200 St. Call 305-284-4166 for more information. Friday, October 30th and Saturday, October 31st from 11am-4pm. Families and kids 12 and under are invited to join the fun as Metrozoo celebrates Halloween with their annual trick-or-treat event. Participate in costume contests, make Halloween crafts and enjoy special performances. General zoo admission is $15.95 per adult and $11.95 per child (ages 3 – 12) Miami Metrozoo is located at 12400 SW 152 street. For more information please visit miamimetrozoo.com/events.asp. October 31st, from 9:30am to 4:30 pm. Bring your dog to Fairchild Garden for a day of four-legged fun, including dog activities and costume contests for both dogs and owners. Admission is $20 for non-member adults, $15 for seniors 65 and up, and $10 for children 6-17. For more information, visit fairchildgarden.org. Open through October 31st. Monday – Friday 6pm to Midnight. Saturday – Sunday 5pm to Midnight. Visit what is billed as the largest Haunted House in South Florida. Ride the Shriek inducing carnival rides. See performances by musical acts, jugglers, tight rope walkers, trapeze acts and more. Includes kiddie rides. Tickets are $22 for adults, $15.00 for children 9 and under. Tickets include unlimited carnival rides and one entry through the haunted house. Miami International Mall is located at 1455 NW 107th Ave. Doral. For information call 305-639-6000 or visit houseofhorrorpark.com. October 29th-31st, from 5-11pm. Visit Miami's Seaquarium for their annual Monster Splash Nightime Bash. For their younger visitors, there will be trick or treating, A Pirate Skeleton Walk, The “Frightening Forest” and the Little Monster Play Area. Older visitors will enjoy unlimited carnival rides, 2 haunted houses including "Buried Alive" along with a live DJ, games and food. Also included are Halloween-themed shows for everyone. Tickets are $24.95 for ages 10 and up, $19.95 for younger visitors. The Miami Seaquarium is located at 4400 Rickenbacker Causeway, Miami. Phone 305-361-5705 for more information, or visit miamiseaquarium.com. Saturday, October 23rd from 7:30-10:30pm. The Deering Estate presents their 9th annual Wine on Harvest Moon Event. General admission tickets are $75 for members and $90 for non-members. VIP Tickets are $150 for members and $175 for non-members. To purchase tickets or for additional information, call 305-235-1668 ext 263. October 23rd and 24th from 9:30 to 4:30. Visit Fairchild Garden for their Edible Garden Festival featuring talks, workshops and demonstrations on creating a vegetable garden of your own. In addition, they will host a scarecrow contest. For much more information and to learn how to enter the contest, visit fairchildgarden.org. Thursday, October 21st at 7pm. Come see the candidates at the last scheduled debate/forum before the election. The debate is hosted by the Whispering Pines Civic Association and will be held at the Whispering Pines Elementary School cafetorium. Whispering Pines Elementary is located at 19829 SW 89th Road (map). On October 22nd, from 6-9pm. Visit the Redland Fruit and Spice Park where the Southern Cross Astronomical Society will guide you through a exploration of the heavens. Bring a blanket or lawn chair and enjoy a campfire and tour of the park under the stars. Food and refreshments will be available for sale. Admission is FREE. For additional information, call 305-247-5727. The park is located at 24801 SW 187th Ave., in Homestead. Saturday, October 23rd from 8pm – midnight. Costumed adults age 21 and over are invited to join the party in the dark, with cocktails, savory treats, music, dancing and entry into Dr. Wilde's creepy House. There will be an award for the best costume. For more information and ticket information, visit zoomiami.org. October 15th-17th, and 22nd-24th, Fridays 6pm to midnight, Saturdays, noon to midnight and Sundays, noon to 10pm. Join in the fun as the German American Club celebrates Oktoberfest. Enjoy German food, beer, carnival rides, German dance groups and youth entertainment and activities. Register to win 2 tickets to Germany. The event takes place at 11919 SW 56th Street. For details, phone 305-552-5123 or visit the German American Club website. Saturday, October 16th. The 34th annual Fall Crafts Festival is back featuring homemade crafts from artists all across the country. Enjoy family-friendly events, music by local bands, a car show, and of course lots of delicious food. Admission is free. Rosary Catholic Church is located at the corner of Franjo Road and 184th Street. Saturday October 16th from 7pm-11 pm. The Rotary Club will host it's 7th Annual Casino Night Mardi Gras Masquerade at the Palmetto Bay Village Center 3rd floor. Enjoy appetizers, an open bar, live and silent auctions, raffles, and door prizes all while experiencing the excitement of casino gaming. Prizes include vacation trips, hotel stays, dinners, sports memorabilia and more. Money raised goes to provide college scholarships for students in our local community. Tickets are $50 each. Palmetto Bay Village Center is located at SW 184th St. and Old Cutler Road. Proceeds benefit the Perrine Cutler Ridge Rotary Foundation. For additional information or to purchase tickets, visit pcrprotary.org, or call 305-897-6827. Tuesday, October 12 at 7pm. Find out what that past year has brought and what's in cutler Bay's future. The event takes place at the Cutler Bay Mercedes-Benz dealership, located at 10701 SW 211th Street. October 9th and 10th, from 9:30am to 4:30pm. Fairchild Tropical Garden will be holding a Bonsai Show and Sale. Award wining bonsai trees will be on display. Visitors will be able to purchase plants and the materials needed to create your own bonsai. The Miami Science museum is offering free admission to residents of Miami-Dade County on weekdays from 3-6pm through September 30th. Proof of residency is required (drivers license, voter ID, or electric bill) and is valid for up to 4 immediate family members. Visit miamisci.org for more information or call 305-646-4200. The museum is located at 3280 S. Miami Avenue. Bay Meat and Deli, a neighborhood butcher shop, has opened in Cutler Bay at 20230 Old Cutler Road (map). Along with reasonably priced cuts of meat, and fresh fish, they feature a variety of freshly made sandwiches to eat there or to take with you. For more information, visit their website at baymeat.com. Thursday, October 7th, Pollo Campero will be giving away one free piece of chicken to anyone visiting their Cutler Bay restaurant. The free chicken is being held in conjunction with Hispanic Heritage Month. For every piece of free chicken they distribute, the will donate an equal amount of chicken to Camillus House. So, drive-through, dine in, or take-out a free piece of chicken and help out a good cause. Pollo Campero is located at 18660 South Dixie Highway. Saturday, October 9th at 10am. 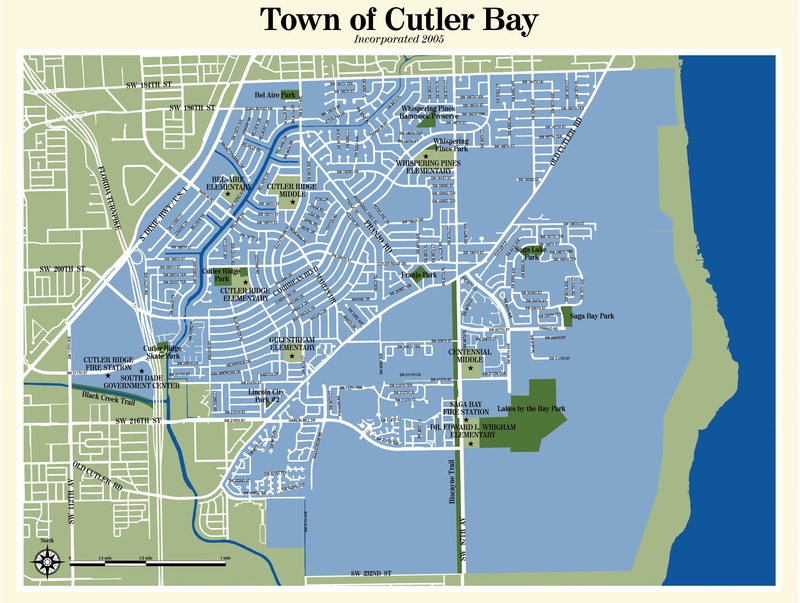 Cutler Bay is on its way to getting a new park. A groundbreaking ceremony for Lakes By The Bay Park will take place at 8551 SW 216th Street, behind Whigham Elementary School. Construction will begin on three lighted baseball/softball fields, two lighted football/soccer fields, a center building with restrooms and concession stand, along with an exercise trail and parking area. For more information, call 305-238-4166. Saturday, October 9th, from 12:30 to 2:20. Visit Center Court at Southland Mall where the Dade Reading Council will be holding a children's read-in session in honor of Hispanic Heritage Month. Come pick up a free book and learn more about Hispanic culture. October 9th from 10am to 1pm. Learn how to grow food in your own backyard throughout the year. Emphasis is on low maintenance tropical plants that can be introduced into your existing landscape. Seeds and cuttings will be distributed to class members. Cost is $25. For reservations or additional information, call 305-247-5727. The Redlands Fruit and Spice Park is located at 24801 SW 187th Ave.
On Tuesday, October 5th, the Cutler Bay Concerned Citizens is sponsoring a forum for the candidates for mayor and Council Seat 1 of Cutler Bay. All five candidates have been asked to participate. The event starts at 7:00 pm at the Community Room in Cutler Ridge Park, located at 10100 SW 200th St. All area residents are welcome. Fairchild Garden is offering free admissions on Wednesday October 6th from 9:30am to 4:30pm. Enjoy their tropical rainforest, butterfly garden, take a yoga class (9:30 am) and tram rides. All for free. For more information, visit fairchildgarden.org. October 2nd from 10am to 5 pm. Learn how to plant, seed, air layer, and graft tropical fruit trees. After, receive a tree to graft and take home. Cost is $40.00. For reservations or additional information, call 305-247-5727. The Fruit and Spice Park is located at 24801 SW 187th Ave.
Sunday, October 3rd starting at 7am. Visit Fairchild Tropical Gardens for their second annual bird day. Start early with a 7am Bird walk, learn about Bird gardening, photography, art, kids activities, a plant sale and so much more. For the days schedule of events, pricing information and more information visit fairchildgarden.org. Perrine Elementary School has reached the semi-finals in the Neutrogena SunProof Your Community Contest. They are asking the community to help them win by visiting http://facebook.com/ChooseSkinHealth. Voting ends September 22nd. July 1st through September 30th 2010. Taxpayers will be able to pay overdue taxes with no penalty and reduced interest during Florida's Tax Amnesty Days. All taxes administered by the Department of Revenue are eligible, except unemployment tax and Miami-Dade County Lake Belt Fees. Taxpayers must sign an amnesty agreement to participate. To apply or to get more information, visit dor.myflorida.com. The Cutler Bay town council held a budget workshop on Wednesday. Despite an anticipated 1.1 million dollar shortfall in ad valorum taxes next year, the council tentatively agreed 4 to 1 to find a way to keep the millage rate at last years level of 2.58. The town may take money out of reserves and make modest cuts where possible to make up the shortfall. More discussion will take place at the budget hearings. Read the proposed budget here. *- Because of the Rosh Hashanah holiday, The September 8th meeting will reconvene on the 14th. Public imput will take place at all 3 meetings. On Sept 30th, from 5pm-8pm, Cold Stone Creamery stores (including the store in the Old Cutler Town Center), are having an ice cream social. Get a free 3 oz sample of "Kate's Creation" ice cream and while you are there please make a donation to the Make-A-Wish foundation. For more information, visit coldstonecreamery.com. September 16th-19th. Trek from Miami to Key West, stopping along the way to hopefully draw a winning poker hand. Then spend the rest of the weekend on Duval Street in Key West enjoying a variety of food, drinks, contests and custom bike show. This fun filled weekend benefits the Diabetes Research Institute. Sign-up begins September 1st. Pre-registration is $35. For more information, visit petersonsharley.com. Saturday, September 18th at 2pm. Visit Southland Mall, in the Sears wing, for a fun-filled day of magic tricks, games, face painting, balloons, music and prizes. This free event is for children 12 and under. September 18th and 19th from 9:30am-4:30pm. The plant show and sale features a large display of Aroids with on-site experts to help you in your selection. The Aroid family includes Alocasia, Anthurium, Caladium, Philodendron, spathaphyllum and others. Fairchild Garden is located at 10901 Old Cutler Rd. For additional information, and to get a $2.00 off admission coupon, visit fairchildgarden.org. September 25th from 10am to 4pm. The Fruit and Spice Park will hold a class on how to grow vegetables in raised beds and containers. Learn how to simplify planting, irrigation, pest control and planting bed construction. A tour of the garden is included. Cost is $35.00. For reservations or additional information, call 305-247-5727. The Fruit and Spice Park is located at 24801 SW 187th Ave.
Saturday, September 25th, from 9:00am to noon. (arrive by 8:30) . The Ocean Conservancy is sponsoring a coastal clean-up. Help keep Miami-Dade beaches and park areas clean. Closest clean up locations to Cutler Bay are Blackpoint marina and the Deering Estate. Immediately after the Cleanup, all volunteers are invited to the Volunteer Appreciation Party at the Miami Seaquarium. For more information, and to register as a volunteer, visit miamidadecoastalcleanup.org. September 25th-26th, from 9:30am to 4:30pm. Learn to identify South Florida's butterfly species and the plants that attract them. Take a butterfly walk through the garden with an expert. Enjoy engaging kid activities. For additional information, and to get a $2.00 off admission coupon, visit fairchildgarden.org. All memberships purchased or renewed on Butterfly Day include a complimentary Butterfly Adoption, a $25.00 value. Not all sunscreens are alike. Some sunscreens contain questionable ingredients. Find out the truth about SPF, red-flag ingredients to avoid, and which sunscreens deliver on their promises. Visit ewg.org. Like yard sales. Visit yardsaletreasuremap.com for a weekly listing of yard sales in our area. Is Your Child's Teacher a Bad Apple? Open to grades 9-12. Complete an essay that answers the question: What civic value do you believe is most essential to being an American? Prizes up to $5,000 will be awarded. For more information, visit beinganamerican.org. Tuesday, September 7th at 7pm. The Concerned Citizens of Cutler Ridge will be featuring Vice Mayor Ed MacDougall as their first guest speaker. Vice Mayor MacDougall is running for Mayor of Cutler Bay in the upcoming November election. The meeting takes place at the community room at Cutler Ridge Park, 10010 SW 200th Street. As always, these meetings are free and open to all residents of Cutler Bay. On Saturday, September 11th, from 8am-3pm, Holy Rosary Catholic Church will be holding a flea market. This venue provides a great opportunity for residents sell their unneeded items. For booth information, call 305-345-1683. Holy Rosary Church is located at 18455 Franjo Rd. September 4th, 5th and 6th. Jungle Island is celebrating Labor Day with $10.00 admission for all Miami-Dade and Broward county residents. Enjoy exotic animal shows or swim and relax on their private beach. Sunday, September 5th from 11am-5pm. (gate opens at 10am). Join the fun as your friends and neighbors celebrate Labor Day with great food and music by the Blackstar Blues Band. General Admission without food is $15 for adults and $10 for kids. General Admission with food is $30 for adults and $20 for kids. The menu includes pulled pork, BBQ chicken, Potato Salad, Corn on the Cob, Garden Salad, Grilled Hot Dog and Chips. For more information, visit deeringestate.com. Fairchild Garden is offering free admissions every Sunday throughout August from 9:30am to 4:30pm. For more information, visit fairchildgarden.org. Monday, August 30th, at 7pm. South Florida author and columnist Carl Hiaasen will be visiting Fairchild Garden for a reading from his new book, Star Island, and will be available to sign your copy. Tickets are $10 for Fairchild members, and $15 for non-members. Purchase a copy of "Star Island" at Books & Books prior to the event and receive free tickets. For more information, call 305-667-1651 ext. 3358. At the July 21st meeting, the town council voted to set the town's MAXIMUM tax millage rate at 3.23. If adopted, this would be a substantial rate increase over the present millage rate of 2.58. The final tax rate will be discussed and set at 2 upcoming budget meetings. Saturday August 28th, starting at 8pm (gate opens at 7). The Deering Estate hosts its Annual Summer Cabaret Series with Folk Singer Bob Ingram. Guests can bring refreshments and snacks to enjoy during the show. Tickets are $20. To purchase tickets or for more information, call 305-235-1668 ext. 233, or visit deeringestate.org. Saturday, August 21st from 10am-5pm. The Deering Estate will host their Fee-Free "P.L.A.Y." Days. Enjoy complimentary admission, hands on eco-art activities, science discovery programs and tours, all for free. There will be art exhibits to view and food available for an additional fee. For more information, call 305-235-1668 ext. 233. August 7th and 8th from noon to 5pm. Enjoy free outdoor activities including paddle boats, face painting, live entertainment, costumed characters, magic shows, crafts, dunk tank, and more. The event takes place at the Falls Shopping Center. Saturday, August 14th from 10am-2pm. Southland Mall will be having a health fair featuring FREE health screenings including blood pressure, glucose, dental and cholesterol checks. There will be information on breast cancer, bike safety and kids finger printing. In addition, attendees will enjoy balloon sculptures, face painting, door prizes, live entertainment by multicultural musical groups, and more. Visit Regal cinemas at Southland Mall for their "Big Flix $5tix". Every movie, every showtime, on every Tuesday is just $5.00. The $5.00 Tuesday movies exclude holidays and 3D shows. For more movie times, visit or call 305-251-7448. The installation of a water pipe under Old Cutler Road will cause the closure of Old Cutler Road between SW 156th St and SW 162nd St for a 2 week period from approximately July 29th-August 11th. The pipeline is part of the SFWMD's Deering Estate Flow-Way Project, which will improve freshwater flows into Biscayne Bay and enhance the surrounding coastal wetlands. For more information about the road closure, see the detour details, drawings, and press release from the Village of Palmetto Bay website. For more information about the Deering Estate Flow-way project, visit sfwmd.gov. From August 13th-15th, the State of Florida will exempt from sales tax, books and clothing under $50.00 and school supplies under $10.00. To see a list of what items are exempt and not exempt, view the Florida Department of Revenue flyer. Friday, July 30th, from 8am-noon and Saturday July31st from 8am-2pm. The Cutler Ridge United Methodist Church, 20740 Old Cutler Road, will hold an indoor Flea Market at the Fellowship Center. Early morning coffee and a hot dog lunch will be available both days. For information, please call 305-235-6651 or 305-235-0561. Miami-Dade County Mayor Alvarez has recently presented his Proposed budget to the Board of County Commissioners. The proposal is to reduce funding for community organizations, rather then increase taxes. If you disagree, a rally to preserve funding for services and jobs will take place on July 19th from 5-7 pm at the Government Center in downtown Miami, located at 111 NW 1 St. An online petition is also available for supporters, at ipetitions.com. Tuesday, July 20th at 8am. The Economic Development Council of South Miami-Dade will feature representatives from FPL updating residents on projects that affect South Dade residents. For more information, visit edcsouthdade.com or call 305-378-9470. July 19th-24th. Celebrate Kids Week at Southland Mall with a variety of educational and entertaining activities. Win prizes and gift cards. Meet the Miami Heat mascot, participate in activities from the Miami Children's Museum and Radio Disney. Sign up for Buffalo Wild Wings "Wing Eating" Contest on July 22nd from 5-7pm. All events take place at Center Court. For more information, call 305-235-8880. Saturday, June 26th, Hormonic Motions – Middle Eastern, Armenian and N. African music and dance. Saturday, July 24th, Johnny Holliday – Proffessional Jazz Musician. Saturday, August 28th, Bob Ingram – Folk singer. Friday, July 16th at 4pm. County Commissioner Katy Sorenson will host the groundbreaking for improvements to the Old Cutler Bike Path. The event takes place at the southeast corner of Old Cutler Road and SW 168th Street. This project includes reconstructing and improving approximately 6 miles of bike paths from 136th Street down to 216th Street in Cutler Bay. For more information on the improvements, contact the county’s public works department at 305-375-2550. Saturday, July 17th and Saturday, August 21st from 10am to 5pm. The Deering Estate will host their Fee-Free "P.L.A.Y." Days. Enjoy complimentary admission, hands on eco-art activities, science discovery programs and tours, all for free. There will be art exhibits to view and food available for an additional fee. For more information, call 305-235-1668 ext. 233. Saturday, July 17th from 1-3pm at the Redland Fruit and Spice Park. Help the environment and save money on your water bills by using a rain barrel. The cost is $45 for the rain barrel and workshop. You must register to participate. Phone 305-248-3311 ext. 242 for additional information. For additional information, visit. July 15th, from 1-4pm and from 7-10pm. The Nuclear Regulatory Commission (NCR) will be hosting Public meetings regarding FPL's application to add two more nuclear reactors to their Turkey Point facility. Each meeting will be preceded by a one hour open house to allow the public an opportunity to talk informally with the agency's staff. To register in advance to speak, contact the NCR's representative Andrew Kugler at 301-415-2828 or email TurkeyPoint.COLEIS@nrc.gov. The meeting takes place at the Homestead YMCA Harris Center, located at 1034 NE 8th Street. Third grade FCAT scores for reading and math have just been released. Test scores range from 1 to 5 with "3" considered to be at grade level. Shown below are the percentage of students in each school scoring at a level "3" or higher. Scores for Cutler Bay schools are shown below along with a sampling of scores from neighboring communities. Scores for other Florida schools can be found at http://fcat.fldoe.org/results/. Saturday, July 3rd, beginning at 7 pm. Holy Rosary Catholic Church invites you to share an evening as they journey through time performing some of the country's most patriotic songs. Bring a blanket and chairs. Holy Rosary Church is located at 18455 Franjo Road. Hamburgers and hot dogs will be available for purchase. July 3rd-5th, from 11am to 4pm. Visitors can celebrate Metrozoo's birthday with $5.00 admission, music, and giveaways. Enjoy 80's music throughout the weekend. There will be free lapel pins and collectable cups to the first 1,000 visitors on the 3rd, and a best 80's outfit contest on the 3rd and 4th at 1pm. July 4th brings free t-shirts and cupcakes to the first 1,000 guests and a BBQ for one low price, along with free ice cream from 11 am to 2pm. For more information visit miamimetrozoo.com. The Whispering Pines Civic Association and the Whispering Pines Woman's Club along with the Town of Cutler Bay will sponsor the 43rd annual Fourth of July Celebration at Whispering Pines Park, located at SW 88th Court and Ridgeland Drive (map). A parade featuring decorated floats and bicycles begins at 9:00am. Participants must report to the Elementary School parking lot, 18929 S.W. 89th Road by 8:15am. Along with patriotic music, there will be a bounce house, water slide, karate demonstration and Humble Hearts Puppet Show for children, hamburgers, hot dogs, snowcones, popcorn, cold drinks, prizes, U.S. Air Force flyover (weather permitting), and free watermelon after the parade. This event is free and open to all residents of Cutler Bay and South Dade County. For more information, read the flyer or call 305-235-6709 or 305-235-0561. There will be a July 4th fireworks display at Black Point beginning at 9pm. The fireworks display is presented though the efforts of Commissioner Katy Sorenson, several municipalities, and local businesses. For more information, read the flyer. Monday, June 28th, 6pm at the South Dade Regional Library. The Town of Cutler Bay received $7.5 million for roadway improvements on Old Cutler Road between SW 97th Ave. and SW 87th Ave. Improvements include roadway reconstruction, curbs, gutters, crosswalks, sidewalks, traffic circles, paths, drainage, lighting, landscaping, bus shelters and bays and more. Attend the meeting to get more information and give your input. Wednesday, June 23rd from 6:30 to 8:30pm. Miami-Dade County Commissioner Katy Sorenson is hosting a town hall meeting. Residents are asked to share their ideas on energy, recycling, transportation, land use, agriculture, green building, and water supplies. The meeting takes place at the South Dade Regional Library. The library is located at 10750 SW 211 Street. For more information call 305-378-6677 or visit miamidade.gov/greenprint. June 24th from 6-9pm. There will be a public workshop to discuss the construction of bridges on Tamiami Trail to improve water flow. National Park Servoce staff will provide a presentation on the plan at 7pm with time before and after for public comments. The workshop takes place at the South Dade Regional Library, 1st floor. For additional information, visit nps.gov. Saturday, June 19th at 2pm. Visit Southland Mall, in the Macy's wing, for a fun-filled day of magic tricks, games, face painting, balloons, music and prizes. This free event is for children 12 and under. June 19th, 10am to 6pm. The International Hurricane Research Center along with Miami-Dade Emergency Management will present a day of informative speakers, and activities to help you prepare and protect your family and house. Experience hurricane force winds. For more information, visit miamisci.org. Sunday, June 20th, 12:30 to 3pm. Treat dad to a Summer Bar-B-Que. Enjoy music and activities for the whole family. Reservations are required. Phone 305-669-6990 for more information, full menu, prices and reservations. Sunday, June 20th. Treat dad to dinner at any of the malls restaurants, and receive 2 free movie tickets. The offer begins at 3pm, while supplies last. Diners must spend $40.00 to be eligible for the free tickets. June 19th and 20th from 10am-5pm. Visit the Redland Fruit and Spice Park for this annual event showcasing local agriculture, tropical fruits, local wines, foods and rare fruit samplings. Enjoy ice-cold fruit smoothies and chocolate-dipped strawberries, a watermelon-eating contest, sack races and water-balloon tossing. The kids corner includes the little farm, face painting and pony rides. The Park is located at 24801 SW 187 Ave. Admission is $8 for adults, free for children under 11. Phone 305-247-5727 for additional information. June 20th, from 2-4pm at the Deering Estate. Celebrate Father's Day with a cruise on the Bay. Bay Cruises are offered on the "Pelican Island Skipper," a 45-foot Corinthian Catamaran. The boat will depart from the Deering Estate and will explore the waters of Biscayne Bay. A Deering Education and Interpretive Staff Member will educate passengers on birds, sea mammals, Native Americans, and early pioneers. Make plans to arrive at 1:30pm. The cost is $35 per person. Celebrate Father's Day – Wednesday, June 16th, 3:30pm. Children 6 to 12 can listen to stories and take part in making a craft for Dad. Magician Brent Gregory – Wednesday, June 16th, 3:30 pm. Brent Gregory invites you to “Make a Magical Splash” with the book '20,000 Leagues Under the Sea'. The Following classes take place at the Fruit and Spice Park. Advanced reservations are required. Call 305-247-5727. May 28th,through May 30th, 9:30 am to 4:30pm. Visit Fairchild Tropical Botanic Garden for this annual show and sale. Experts and enthusiasts alike will display and discuss this drought tolerant plant. Presented by the South Florida Cactus & Succulent Society. For more information and a $5 admission coupon, visit fairchildgarden.org. May 29th–31st. Visitors to Jungle Island who buy a one day ticket ($32.95 adults, $24.95 children under 10) will get a free BBQ lunch and a free 2010 pass. For more information, visit jungleisland.com. Saturday, May 29th-Monday, May 31st, from 9:30am to 4:30 pm. Fairchild Tropical Garden is waiving admission for all present and former military personnel on Memorial Day weekend. They will also offer 50% membership fees to military personnel. May 29th – 31st, 10am to 6pm. Discover the important role the wetlands play in our environment and the benefits they provide. This event takes place at the Miami Science Museum located at 3280 S. Miami Ave. For information contact Kate Walker at kwalker@miamisci.org, phone 305-646-4264, or visit miamisci.org. On Saturday, May 22nd and Sunday, May 23rd, from 9:30am to 4:30pm, visit Fairchild Tropical Botanic Garden for their sale of this hearty plant. Fairchild Garden is located at 10901 Old Cutler Rd. Call 305-667-1651 or visit fairchildgarden.org for more information and a $5.00 off admission coupon. Thursday, May 13th at 7pm. There will be a zoning workshop to discuss the site plan for City Furniture to erect a 57,721 sq. foot furniture store near their current store on US-1. The workshop takes place at Cutler Ridge Park. Monday, May 24th, 6pm at the South Dade Regional Library. The Town of Cutler Bay received $7.5 million for roadway improvements on Old Cutler Road between SW 97th Ave. and SW 87th Ave. Improvements include roadway reconstruction, curbs, gutters, crosswalks, sidewalks, traffic circles, paths, drainage, lighting, landscaping, bus shelters and bays and more. Attend the meeting to get more information and give your input. For more information, read the flyer. On Thursday, March 11th, the South Florida Water Management District (SFWMD) Governing Board signed a contract to acquire approximately 130 acres of wetlands from Cutler Properties LC. This property, located SE of 184th Street and Old Cutler Road, will be used in the implementation of the Biscayne Bay Coastal Wetlands Project(BBCW). BBCW is a plan to rehydrate the coastal wetlands and restore a more natural flow of fresh water to Biscayne Bay, and is one of the components of the Comprehensive Everglades Restoration Plan (CERP). For 3 years local residents and environmental groups have fought to stop this property from development and save the wetlands. The property owners and the district finally agreed on a price of $24.5 million. Cutler Properties LC will maintain ownership of 8 acres of land adjacent to Old Cutler Road. May 14 through May 16, from 9:30am-4:30pm. Fairchild Art instructors and students will showcase more then 150 original paintings. For more infortmation, visit fairchildgarden.org. May 14th-16th from 9am-5pm. Visit the largest annual orchid show in the US with over 50 booths and vendors. Various types of orchids, plants, and supplies are for sale, as well as lectures by experts, raffles, and international food. The event takes place at the Redland Fruit and Spice Park. Admission is $7. On Sunday, May 16th, from 2-4pm (arrive by 1:30). Take a cruise on the "Pelican Island Skipper", a 45-foot catamaran, as you explore the waters of Biscayne Bay. Learn about birds, sea mammals, Native Americans and early pioneers. The cruise is open to all ages at a cost of $35.00 per person. To reserve your space, call 305-235-1668 ext. 233. For more information visit deeringestate.org. May 16th in Greynolds Park. Celebrate the 1960's with music, vintage clothing and approximately 5,000 other groovy visitors. This years event features music from "The Grass Roots". There is a 60's costume contest, kids zone, arts and crafts, Hula-Hoop contest, Frisbee throwing contest, Tie-dying tee shirts, sidewalk chalk drawing for children and much more. Greynolds Park is located at 17530 W. Dixie Highway, N. Miami Beach. For more groovy information, visit www.miamidade.gov/greynoldslovein/home.asp. The County Commission has allocated an additional $344,000 for development of interpretive nature trails at Lakes By The Bay Park. The county recently transferred 49.3 acres of Lakes By the Bay Park to the town of Cutler Bay to develop into playing fields and other recreational uses. The nature trails will be located in the remaining 55.24 acres of natural preserve area retained by the county. For more information, contact Commissioner Sorenson's office at 305-378-6677. Friday, May 7th,10:30am, at the Deering Estate. Show your support for Everglades Restoration by attending the groundbreaking for the Deering Estate flow-way, a component of Biscayne Bay Coastal Wetlands, an important step towards healthier coastal wetlands. See the map of the flow-way project. May 4th at 7pm at Christ Fellowship Church, 8900 SW 168th Street. This is the second and final zoning hearing and your last chance to express your opinion concerning the Palmer Trinity school expansion. Cutler Bay, Miami-Dade County's First "Green City"
The town of Cutler Bay was recently designated as Miami-Dade County's first "green city", having been awarded silver status by the Florida Green Building coalition for outstanding environmental stewardship. You can find out more about this designation by visiting floridagreenbuilding.org/local-governments. 26.19% did not want dogs allowed in any of our parks under any circumstance. 26.19% did not want them on leash in our parks, but would be okay if they were in a fenced dog park. 21.43% want dogs to be allowed to walk on leash in our parks, but did not want a dog park. 26.19% want dogs to be allowed on leash in our parks and for the town to also provide an off leash park. Thanks to all who responded. As always, we encourage you to voice your opinions to the town council. May 1st from 5pm to 11pm. Visit the zoo for a chance to sample over 100 kinds of beer from around the globe. Live perforance by "The Dan Band" along with local bands Juke and King Bee. Tickets $25 pre-sale, $35 at the door, or $65 for VIP. Visit miamimetrozoo.com for more information. In addition, residents are urged to attend the 2 upcoming zoning hearings. The first is on April 29th at 7 pm at the Deering Estate Visitors Center. The second, and most important, takes place on May 4th at 7pm at Christ Fellowship Church, 8900 SW 168th Street. For more information, contact the Concerned Citizens of Old Cutler Inc., at CCOCIBoard@bellsouth.net. The state of Florida will offer a 20 percent rebate off the retail price of a new qualified ENERGY STAR® appliances, including clothes washers, refrigerators, dishwashers, room air conditioners and freezers. This program is available to all Florida residents through a mail-in rebate application. It will launch on the state's Web site April 16, 2010, and conclude April 25, 2010. Purchases must be made during that timeframe in order to qualify. No guarantee of a rebate is given; rebates to consumers will be made on a first-come, first-serve basis as long as the money lasts. View frequently asked questions ot MyFloridaClimate.com. April 17th and 18th from 10am-5pm. Find great ideas for transforming your backyard into a tropical paradise. This event features exhibits, workshops and lectures, and a green market. Cost is $5.00, kids 12 and under free. For more information, call 305-284-0900 or visit pinecrestgardens.com or call 305-284-0900. Pinecrest Gardens is located at 11000 Red Road. April 17th and 18th from 9:30 am to 4:30 pm. Visit Fairchild Gardens for the Bromeliad Show and Sale. Visit fairchildgarden.org for more information and a coupon for $5.00 off your admission ticket. Sunday, April 18th, noon to sundown. Visit Crandon Park (North Beach entrance) on Key Biscayne for an Earth Day celebration of the Earth, the Everglades and the promise of a sustainable South Florida. Enjoy musical performances and workshops on organic gardening, raw food preparation, yoga and much more. Bring a blanket or chair, your own water bottle (free refills), drum or instrument for the drum circle. You can also drop off any electronic or computer equipment to recycle. Visit earth-learning.org for more information. April 18th from 10 am to 6pm. Join the fun at this Earth Day event featuring recyclable paper making, solar cooking demonstration, interactive stage shows, face painting and more. For more information, visit miamisci.org. April 17th and 18th. Jungle Island presents "Earth Miami" a two-day event commemorating the 40th anniversary of Earth day. There will be shows, activities and exhibits geared towards living green. Jungle Island is located at 1111 Parrot Jungle Trail, in Miami. For further information, visit parrotjungle.com. On April 21st, the U.S. Army Corps of Engineers is hosting a public meeting at Deering Estate, 16701 SW 72 Ave. An open house will begin at 6:30 p.m., followed by the public meeting at 7. This is an opportunity to discuss concerns related to Biscayne Bay restoration, part of the larger Everglades restoration plan. Thursday, April 22nd, from 9:30 am to 4:30 pm. Come celebrate Earth Day at the Gardens, and enjoy free admissions. April 23rd at 7:30 pm. Join our neighborers to the north for Movie Night at Coral Reef Park. The event is free. The featured movie is Planet 51. Saturday, April 24. As part of the Village of Palmetto Bay’s 3rd Annual Earth Week Celebration, Laura Reynolds and a team of Tropical Audubon volunteers will lead several kayak trips from People’s Dock at the Deering Estate in Palmetto Bay, on Saturday, April 24. Up to four trips are planned; two for advanced kayakers and two for novices. Advanced groups will shove off at 8am and 3pm; novice trips will take place at 10am and 1pm (following a lesson and safety discussion). The Village is offsetting the cost of the event by providing a generous donation to the Tropical Audubon Society. As a result, this year’s registration fee has been reduced to just $10 per person, which covers the cost of a kayak rental and guided tour. (Annual membership to the TAS is available for an additional $10.) The first 50 to register will receive a promotional Earth Week Kayak Tour t-shirt, sponsored by Community Newspapers, Inc. Mileage is dependant on group experience and weather conditions. Each participant should bring their own water and snacks. Trip space is limited. For reservations, please contact Beth Kibler via email oldcutlersouth@gmail.com or call 786-877-6489. Saturday, April 24th, 11am–2pm. The town of Cutler Bay is celebrating Earth Day by establishing a community garden at Cutler Ridge Park where residents can grow their own seasonal vegetables. The first 25 residents to register as volunteers will be allowed to select their own plot. The town will provide the materials. Cutler Ridge Park is located at 10100 SW 200 Street. For additional information, call 305-238-4166. April 24th and 25th from 9:30am to 4:30pm. Visit Fairchild Garden for their annual celebration of fresh foods and beautiful gardens. Watch culinary demonstrations and visit the Farmers Market featuring a variety of fresh produce. While you're there, purchase plants at the 31st annual spring plant sale. Fairchild Gardens is located at 10901 Old Cutler Road. For more information, call 305-256-8399 or visit fairchildgarden.org. Thursday, April 15th, from 6 to 9pm. Mans best friend is invited to visit Fairchild Gardens for a howling good time. Enjoy beer tasting for you and dog masages and treats for your 4 legged friend. For admission fees, doggy rules and other information, visit fairchildgarden.org. Saturday, April 17th from 7am to 7pm. Cutler Bay residents are encouraged to take part in the town's first community-wide Garage Sale Day. Sales take place at your individual home. No permit is required, as this event does not count towards the 4 sales an individual is allowed per year in Cutler Bay. For more information, contact town hall at 305-234-4262. April 17th, from 2-4pm. Visit the Falls for two Earth Day events. First, Fairchild Gardens will be at Bloomingdales 3rd floor where you can learn how to grow your own container garden, and watch a cooking demonstration. Next, visit the Falls Center Court as Radio Disney along with the "Little Planet Helpers" celebrate Earth Day with activities that instill respect for the planet. Activities include eco-friendly arts and crafts, a recycling game, planting your own herb, and giveaways. Saturday, April 3rd at 10am. Children 9 and under can hunt for Easter eggs. Prizes will be given for special eggs found in each age group. The first 100 children will receive a “4x6” framed picture with the Easter Bunny. Parents can also take their own pictures of their child with the Easter Bunny. The event takes place at Cutler Ridge Park, located at 10100 SW 200 Street. Sponsored by TD Bank, and Rodbenders, For additional information, call 305-238-4166. Saturday April 3rd, 10am–noon. Learn how easy it is to grow your own herbs in South Florida. This class takes place at the Redland Fruit and Spice Park. Cost is $25 per person. The Park is located at 24801 SW 187 Ave., in Homestead. Phone 305-247-5727 for more information. Saturday and Sunday, April 3rd and 4th from 11am-4pm. Join the fun at Metrozoo during their Great Egg Safari. There will be continuous egg hunts, and games and prizes for kids 12 and under. Enjoy music, bounce houses, the Easter Bunny. and much more. The Zoo is located at 12400 SW 152nd Street. For more information, visit miamimetrozoo.com. April 2, 3, & 4th. South Florida's longest-running Easter celebration returns to Jungle Island. The annual Easter Eggstravangaza is an egg-citing 3-day event benefitting the Parent Academy. The event will feature Easter Egg Hunts with over 50,000 eggs, stuffed with more than 800 pounds of candy, toys and prizes! Experience the famous pie-eating contests, arts and crafts stations, animal encounters, and bounce houses that will fulfill every child's delights. Look out for special appearances by Babar the Elephant, Pepe the Parrot and even the Easter Bunny himself! The park is open from 10am to 6pm. Easter event activities are from 11am to 5pm. For more information, visit jungleisland.com. Sundays from 9am-2pm. The farmers market, previously located at Gardners Market, has moved to Pinecrest Gardens, located at 55 SW 111 Street. On Thursday, January 21st, the Miami-Dade County Commission voted to give 49 acres of property known as Lakes-By-The-Bay Park to the town of Cutler Bay along with funds to help develop the property. This acquisition more then doubles the previous amount of park space within Cutler Bay. In anticipation of this acquisition, the town has already begun the process of finding a design/build firm with the hope of moving forward as soon as possible. Development of this park, which was first promised to the residents in the early 70's, was never built. For more information about the location of this park and a look at it's future development, see the town's Parks Master Plan. Limited free parking is available on the TAS grounds via the 55th Avenue gate and along 56th Avenue - Metered parking is available on Sunset Drive. March 27th, 10am-2pm at Pinecrest Gardens. Come hop through the gardens and kick off the begining of Spring. Kids ages 10 and younger are invited to find eggs during 5 different egghunt times. Festivities include spring characters, face painters, balloon artists and a wild animal show. Don’t forget to take a picture with the "Spring Bunny." Pincrest Gardens is located at 11000 Red Rd. March 27th at 7pm. Bring your blanket to Ludovici Park and enjoy the great outdoors while listening to bands battle it out for a cash prize. Ludovici Park is located at 17641 Old Cutler Road, in Palmetto Bay. For more information, read the flyer. Sunday, March 28th from 11am-6pm. Savor delectable seafood and enjoy the music at the Deering Estate's Seafood Festival on the Bay. This event features food, entertainment,scenic boat rides, cooking demonstrations, and a Kids Zone. Cost is $15.00 for adults ($12 if purchased in advance on-line) and $5.00 for Children ages 4-14. The event takes place at the Deering Estate, located at 16701 SW 72nd Ave. For more information, call 305-235-1668 ext. 263, or visit deeringestate.org. March 13th beginning at 5 pm until noon on March 14th. Join the residents of Cutler Bay and Palmetto Bay as they join to raise money for cancer research. The relay will take place at Miami Childrens Hospital, South Dade Center, located at 17615 SW 97th Ave (near the intersection of US-1 and Franjo Rd). For more information visit. If you can't make it to the event but wish to make an online donation, visit. The Deering Estate Living Artist Concert Series presents "Convergence" on Friday, March 19th featuring the Bergonzi String Quartet with the Deering Estate Chamber Ensemble. The concert begins at 7:00 pm in the historic Stone House Ballroom, with a Meet the Artist Reception at 6:30 pm. Tickets are $25 for Adults and $12 for Youth (Grades K-12, Student ID requested). You can purchase tickets online for an additional fee of $2.50 per adult ticket and $1.00 per youth ticket. You can also call the Deering Estate Ticket Office at 305-235-1668 ext. 233. March 6th and 7th from 10am-6pm. Celebrating its 21 year, this annual festival features Asian crafts, art, exotic music and dance, as well as authentic Far Eastern cuisine. Admission is $10, children under 11 are free. The Redland Fruit and Spice Park is located at 24801 SW 187th Ave., in Homestead. March 7th, from 11am-4pm. This event features European and exotic models, along with music, arts and crafts, food, pony and horse-carriage rides, and much more. Parking and admission are FREE. For more information, contact Gerry at (786)344-4228. February 23rd and 24th, from 10am-5pm at Jungle Island. Families from all over South Florida will get together to learn about the importance of eating healthy and staying fit. The event includes several celebrity chefs including Rachael Ray and Paula Deen. Admission is $20 in advance, or $28 for adults and $23 for children per day on the day of the event. Jungle Island is located at 1111 Parrot Jungle Trail, Miami. To find out more about the different chefs, and thetimes they will be in attendance, visit funandfitasafamily.com. Thursday, February 25th. Enjoy a cabaret-style concert at the Deering Estate's Stone House Ballroom featuring Folk Singer and Coconut Grove native Bob Ingram. The concert begins at 8 pm and the main gate opens at 7 pm. Guests are welcome to bring refreshments and snacks to enjoy during the show. Single Tickets are $20 and the three-concert series is $55. Limited seating is available. Advance tickets are recommended. Seating is available on a first-come, first-serve basis. For more information, visit www.deeringestate.org. To purchase tickets, please contact the Deering Estate Ticket Office at 305-235-1668 ext. 233. Thursday, February 25th from 6-9pm. Fairchild Gardens will host a romantic movie night featuring the film "When Harry Met Sally". Shown outside on the Garden House lawn, you are encouraged to bring a blanket and picnic basket. Adult admission is $15.00 for non-members. For more information visit their website at fairchildgarden.org. Saturday, February 27th from 10am-2pm. This event for women features a fashion presentation followed by a heart healthy fair. There will be free health screenings, resources and referral information. Healthcare professionsls and service providers will be on site. This free event takes place at Dadeland Mall's Center Court. For more information, call 305-665-6226. On Saturday, February 20th from 11am-3pm at Cutler Ridge Park. Join your friends and neighbors to celebrate Cutler Bay's 4th anniversary. Enjoy: food, entertainment, rides, games, and more. Come prepared to participate in the Cutler Bay food fight and bid to throw a pie in the face of your "favorite" council member. Cutler Ridge Park is located at 10100 SW 200th St. For more information, call 305-238-4166. (map). Saturday, February 20th at 8pm (Doors open at 7).Bring your blanket and picnic basket to the Doc Thomas House and enjoy an outdoor concert featuring acoustic duo Jennings and Keller. Addmission is a $10 donation. A cash bar and appetizers will be available. Monies collected will be used to help in replacing the chikee roof where educational workshops and events take place. For more information visit, tropicalaudubon.org. Saturday February 20th, from 10am-4pm. Enjoy music and entertainment, ribs, petting zoo, carnival activities, fun and games, and more. Admission is $1 and proceeds benefit the schools athletic department. Coral Reef High School is located at 10101 SW 152nd St.
Saturday, February 6th, from 8am-3pm, Holy Rosary Catholic Church will be holding a flea market. This venue provides a great opportunity for residents sell their unneeded items. For booth information, call Elaine Rhatigan at 305-345-1683. Holy Rosary Church is located at 18455 Franjo Rd. February 6th, from 10am-2pm. You can surrender your exotic pets, free of charge with no questions asked, during Metrozoo's Non-Native Amnesty Day. For more information, visit miamimetrozoo.com. Friday, January 22nd through Sunday, January 24th, from 9:30am until 4:30pm.. Visit Fairchild Gardens for their Forth Annual International Chocolate Festival. This event will feature chocolate treats, along with coffee and tea. Enjoy cooking demonstrations, informative lectures, tree sales along with chocoKids and ChocoWalk. The event takes place at Fairchild Tropical Gardens located at 10901 Old Cutler Rd.. For more information, visit fairchildgarden.org or call 305-667-1651 ext. 3344. January 29th, 30th, and 31st. The Homestead Rodeo is back for its 61st year. For additional information on both the rodeo and Frontier Days, visit homesteadrodeo.com. Saturday, January 30th from 9am to noon at Cutler Ridge Park. Dr. Patricia Fulton will be presenting a free job hunting workshop. Participants will learn how to assess their job skills, write and effective resume and conduct a successful interview. For more information, contact Dr. Fulton at 305-596-2110. You can RSVP by emailing patful@yahoo.com. Sunday, January 31st from noon to 7:00pm. "Sammie Jo Day", a family fun daywill take place at Cutler Ridge Park. The event will feature food from local restaurants, police, firefighters, celebrities, games, raffles, and music along with raising awareness about gun safety. The event is in honor of Cutler Bay resident Samantha Jo Meerbott, 14, who was accidentally shot and killed last November. The $5.00 admission charge will be donated to the Merrbott family. Cutler Ridge Park is located at 10100 SW 200 Street. For more information call Kim Haar at 305-321-5171, or Becky Parker at 786-863-2994. See the flyer for more information. Free Cat Spay/Neutering – MEOW!!! Sunday, January 31st. Commissioner Katy Sorenson along with Miami-Dade Animal Services will host this second annual event to help control the pet population. Cat owners are urged to call today to make an appointment. There is no cost for this service. Prior to sterilization, pet owners must show proof of current rabies vaccinations or agree to obtain the vaccine on the day of service at no additional cost. All cats will be ear tipped to identify them as sterilized. To make an appointment, call 305-805-1603. The animal clinic is located at 10700 SW 211 Street, in Cutler Bay. Saturday, January 23rd from 1-4pm. Visit Baptist Hospital for their 19th Annual Health Day for Women. This free event includes health screenings, demonstrations, chair massages and lectures by experts. Baptist Hospital is located at 8900 N. Kendall Dr. For more information, call 786-596-5981 or visit baptisthealth.net. Saturday, January 16th from noon - 6pm. Visit Southland Mall for a free H1N1 Vaccine. Inoculations will take place in the JC Penney Wing. Nurses and health clearks will be available to answer your questions and provide pamphlets and related materials. Saturday, January 16th and Sunday January 17th from 10am-5pm. Visit Pinecrest Gardens for their fine arts festival featuring a variety of mediums from nationally recognized artists as well as local artists. Pinecrest Gardens is located at 11000 Red Road, in Pinecrest. For more information visit pinecrestgardens.com. January 16th and 17th from 10am until 6pm. The Miami Science Museum will be celebrating winter with "A weekend filled with icy science experiments and cool demonstrations". For additional information about the museum, visit miamisci.org or call 305-646-4264. The Miami Science Museum is located at 3280 South Miami Avenue. Cutler Ridge United Methodist Church is having an indoor Flea Market on Friday, January 22nd from 8:00 am- noon and Saturday, January 23rd from 7:00 am to 1:00 pm. Early morning coffee and a hot dog lunch will be available. The church is located at 20740 Old Cutler Road. For more information, call 305-235-0561 or 305-235-6651. Saturday, December 26th through Sunday January 17th. You can recycle your Christmas tree by taking it to the Eureka Drive transfer station or a designated drop off location at the South Dade Landfill. To recycle, remove all decorations including tinsel. Curbside recycling is available from January 7th ONLY. Remove all decorations. Recycled Christmas tree chips will be available at the Eureka Drive station in late January. Eureka Drive Trash and Recycling Center is located at 9401 SW 184 Street. It is open daily from 7am to 5:30pm. The South Dade Landfill is located at 24000 SW 97 Avenue. Gate A. from 7 am to 5 pm. For additional information, visit miamidade.gov/dswm/recycling_trees. Saturday, January 9th. Starting time is between 9am and noon with the event ending at 5pm. An event for car enthusiasts, history buffs and those who enjoys a leisurely drive through rural South Miami-Dade County. Participants start at Cauley Square, located at US-1 and 224 Street where they receive a map, driving directions, and a series of questions to be answered along the way. The event moves on to other Homestead destinations. The cost is $5.00 per team. For more information visit, redlandriot.com or email rob@redlandriot.com. Saturday, January 9th beginning at 8am. This event begins at Homestead Hospital and proceeds through the surrounding neighborhoods. Cost is $20 pp before the day of the race, $25 on race day, and $10 for ages 18 and under. To register or for more information, call 786-243-8220, or e-mail thomassc@baptisthealth.net. For additional information, visit baptisthealth.net. January 9th and 10th, from 10am-5pm. Visit the Redland Fruit and Spice Park for this annual festival featuring arts and crafts, tropical plants, food, and children's activities including a petting zoo, pony rides, puppet and magic show, and Everglades reptile show. Admission is $8.00 for adults, free for children under 12. The park is located at 24801 S.W. 187th Avenue, in Homestead. Phone 305-247-5727 for more information. January 3rd from 7:30am until 12:30pm at Blackpoint Marina. Come along as two expert flats fishermen take you on a guided fishing trip along the shore of Biscayne Bay. Kayak, paddle and safety equipment will be provided. A valid Florida saltwater fishing license is required. Cost is $85 per person. For more information, phone 305-365-3018. Sunday, January 3rd from noon to 4pm. Featuring the art of Yayoi Kusama along with "Polkadots and Fingerprints", which will introduce kids to art allowing them to create and take home their own art project. Volunteers will paint polka dot faces, and kids can try their hand at playing a musical instrument. The event takes place at Fairchild Tropical Gardens, located at 10901 Old Cutler Rd. For more information, visit fairchildgarden.org or call 305-667-1651 ext. 3344. December 19th-January 2nd. Visit the Miami Seaquarium for it's annual celebration. Enjoy a magical snow fall, Kid's Winterfest, illuminated sea themed sculptures, and much more. For additional information, call 305-361-5705, ext. 225 or visit miamiseaquarium.com.